Some patents are considered stronger than others because they are more enforceable. The difference lies not just in the usefulness of the innovation, but in the patent’s claims. An enforceable patent has a strong set of claims that is both broad and succinct. Not all patents are created equal. If you browsed through the eight-million-plus patents granted by the United States Patent and Trademark Office (USPTO) since 1836, you would find a surprising number of inventions that would not stand against infringement. Some patents are considered stronger than others because they are more enforceable than others. The difference lies not only in the innovation itself but in the patent’s claims. An enforceable patent has a strong set of claims that is both broad and succinct. A weaker patent often has a set of claims that is minutely specific, detailed and long-winded. Since claims are the backbone of a patent, an informed inventor is well-served with the knowledge of what an enforceable patent looks like compared to a weaker one. An example of each is illustrated here. Before diving into the example claims, let’s review how the USPTO determines patentability with three common definitions, which I paraphrase below. US Patent Law, 35 U.S.C. 102 Conditions for patentability; novelty. - You already patented it more than a year ago. - You made only a slight and obvious change to something that was already invented. For example, you developed a wheelbarrow made of titanium. - You stuck two things together that did not result in changing either of them. For example, you added a clock to a wheelbarrow (you know, so you can determine what time you must stop hauling these here bricks. Or something). - Nor did it result in a new thing (The Clockbarrow! What we’ve all been waiting for!). This rule says that whatever you invent should not only be new, but useful. Or a useful improvement of a process, machine, method of manufacture or composition of matter. For example, the clothespin, when it was patented in 1887, was not only new, but pretty useful. OK, say your invention meets all these criteria. Does that mean you’ll get a patent? Well… let’s say you have invented something, but it’s not exactly novel. You go ahead and prepare a patent application and send it off to the USPTO with the requisite forms and fees. After examining it, the patent office rejects it. Is that the end of the line for your clothespin improvement? Not necessarily. Because here is where you get the chance to refine, or limit, your invention, by making it more specific. Without departing from your original application, you further and more specifically define your invention to make it stand out as something unique. To do that, you revise your patent claims. Below I show two inventions and their claims, demonstrating all three criteria of novelty, usefulness and at least some degree of non-obviousness. One of these patents is stronger than the other, and the difference lies in its claims. wherein each weight has a weight between 10 g to 50 g.
…wherein the elongated member does not include a hook, and wherein each weight has a weight between 10g and 50g. That might seem odd to you — Why say that it doesn’t include a hook? Does it also not include a clock? Why be so specific about the size or weight of the thing? The reason is that doing so limits the scope of the invention. The inventor was compelled to be this specific because previous inventions have already covered the big idea — like a “A garment arrangement system with a hanger and a weighted bar that clips onto the bottom of a garment,” full-stop. But these previous inventions (referred to as “prior art”) were pretty much the same thing as the basic idea of this invention. One of those was a garment support system with hooks, and another was one with adjustable weights. So to avoid infringing on these previous patents, Ms. Mangano had to go a step further and make hers different, or “patentably distinct” from the prior art. You can see this in action when you look at the last two lines of the claim. These claims served to further limit the invention until the patent office deemed it novel enough to grant it a patent. 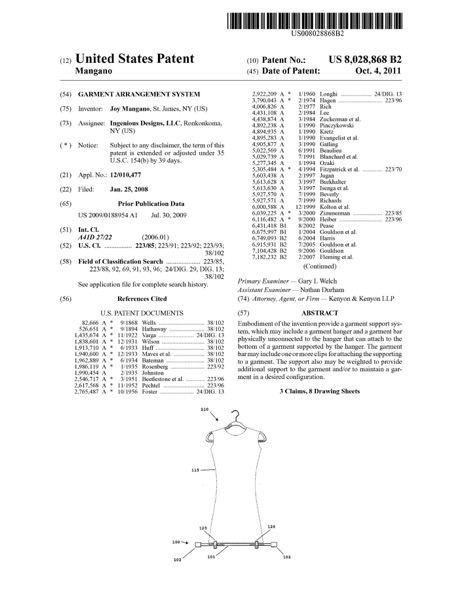 It’s not the greatest, first and best, and probably not everything she dreamed of when she invented her garment-arrangement system, but it was good enough for Ms. Mangano to get a patent and profit from her invention. Here is another patent and its claims. 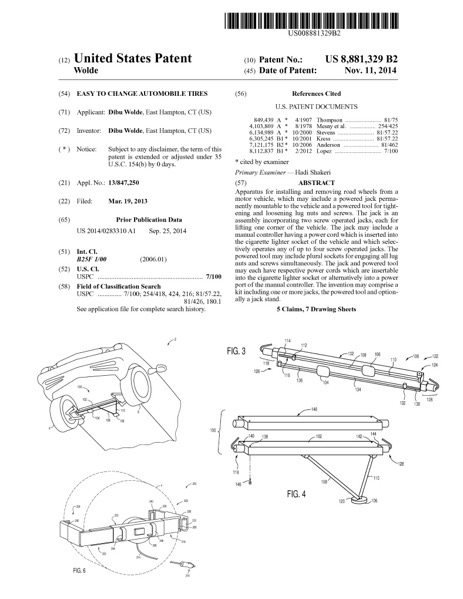 Patent number 8,881,329 is a kit with a motorized jack that is used for changing a tire. It has worm-drive screws and an angled linkage to lift a vehicle, plus a second device that attaches to a wheel and removes all of its lug nuts at once. a lug threading tool disposed to tighten and loosen lug nuts and screws of the wheel of the motor vehicle, comprising a frame, a plurality of drive sockets mounted to the frame, a common drive which rotates all of the drive sockets in the same direction when the common drive is rotatably driven, a motor disposed to rotatably drive the common drive, and a clamp disposed to engage the wheel of the motor vehicle, whereby the powered lug threading tool is supported on the wheel, wherein the drive sockets may each engage one lug nut or screw of the wheel such that all of the lug nuts or screws are engaged and simultaneously loosened and tightened when the common drive rotates the drive sockets. That’s just the first claim. There are many more, each of which further limits the invention. The more specific this invention gets, the less enforceable it becomes against all the possible iterations of things to come that are just like it, but not exactly like it. Yes, it’s novel enough; but only so novel as to have never existed before in its very specific state; and it has been rendered hyper-specific by repeat tweaks designed to get around the prior art. is a kit because all its separate components have been found to already exist. So, to make this invention “novel,” the inventor likely gathered all the components, made a kit out of it, and got a patent. (It is not that simple, but that’s the end result). A patent of this nature might be difficult to defend against infringement. Although it prohibits making, using or selling a kit just like it, it does not prohibit someone from making, using or selling any one of the components of this kit. On the other hand, sometimes having any patent, even an extremely narrow one, could be a decider in, say, landing a licensing agreement. And such a patent could even be useful and beneficial to society. But it could be difficult to defend and easily infringed upon -- one reason that all patents are not created equal. Scott Keeley is a patent agent with a background in industrial design and engineering. He runs keeleydeangelo.com, an intellectual-property firm.